Do you remember when you were first dating your partner? You paid attention to what they said, looking for clues as to what was going on in their lives and what was important to them. Now, years later, it’s easy to put your partner’s needs on the back burner as you navigate the busy-ness of work, kids, extended family and other stressors, but this can lead to a disconnect between the two of you that may feel difficult to overcome over time. 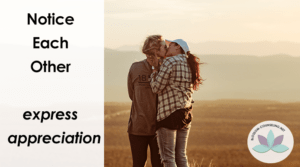 However, it is quite simple to stay connected by doing small things every day that can help you build intimacy and trust in your relationship, which can keep you strong when life seems overwhelming. The most important thing you can do is listen to your partner. Pay attention. Make a point of checking in with your partner when you leave in the morning and when you come home. It doesn’t have to be a long conversation. Just ask your partner what is on their schedule for the day in the morning and then remember to ask how the day went when you come home. Listening to your partner and knowing what challenges they are facing and successes they had can build continuity and provide a quick way to make your partner feel supported and valued. Knowing you care about their day to day experiences is one of the most important ways to strengthen your relationship and provide you with the connection you need to face more challenging times when they occur. A quick check-in coupled with a 10 second hug when you see each other for the first time at the end of the day can do wonders to restore a sense of closeness and prepare you both for the evening ahead. Tune into your partner. Notice their body language and try to tune into what they are feeling. Another way to make your partner feel loved might be to do a chore for them that you know they hate to do. If your partner is going through a stressful time, offer to cook dinner or take the kids out while they work on a project for the next day. Take out the trash or sweep the floor. If you have been out of town or busy with meetings or working late, plan a date night for the weekend and get a sitter. Specifically acknowledge that your partner picked up the slack for you and how much you appreciate their support. Don’t keep a list of all you do and expect exact reciprocity. If you have a spare moment and you notice a pile of dishes and your partner is giving the kids a bath, do the dishes so that you both can enjoy a cup of tea or a glass of wine together after the kids go to bed. If your partner seems overwhelmed and stressed out and you don’t know what you can do to help, ask them what you can do to help and genuinely agree to do that task without complaining. Being a team and sharing responsibility rather than expecting your partner to do something for you in return benefits both of you. If you feel like your partner is taking advantage of your generosity and doesn’t share responsibility for daily tasks, talk about it when you are not under stress. Make a point of discussing household tasks together and honestly talk about who does what and how you might be able to re-allocate some of the responsibilities so that each of you has some private time or if you can afford to do so, perhaps hire someone to do some of the chores once a month. Notice each other. Express appreciation for what your partner does for the family. Tell each other that you think they are a great mom or dad and specifically mention what they do that makes you feel that way. Say “please” and “thank you” often. Have their coffee ready for them when they get up if you get up first. Watch a sporting event or television program that you don’t ordinarily watch but your partner does. Share your lives and be grateful for each other. The effort you make to make your partner feel loved and appreciated will make you feel good when you see the way they smile and the increased trust and intimacy is a bonus that will continue to pay dividends as the years pass and your relationship deepens into what you need and desire to grow as an individual. Your relationship gets better and you get better because of it. Looking for help with your relationship? We’re here for you! Schedule your free 30-minute consult today. Sonya helps couples, teens, and adults with coping skills and relationship issues. Her approach focuses on building strengths and resiliency, collaborating with her clients to explore experiences and achieve relief while accomplishing goals.